"A secret experiment. A deadly virus. A fatal mistake." 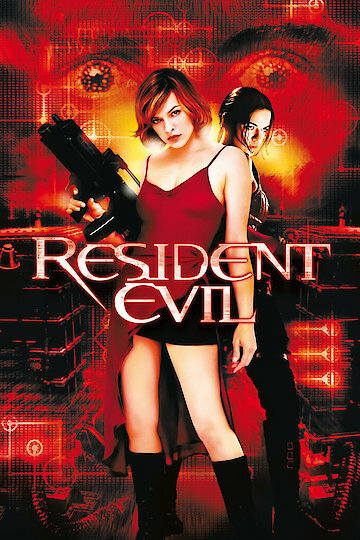 This film is one example of the successful adaptation of a video game series into a movie. The zombie and undead genre seems to have become ever more popular as time goes on, lending itself to video games, movies and even television. The movie begins with an unconscious couple waking to no memory in a mansion. Unknown to them, the mansion is a cover for a secret underground facility known as The Hive. This facility is run by the Umbrella Corporation, outside Raccoon City, for genetic research. What they have developed there was the T-Virus. A group of commandos burst in and take the pair to an underground train station where they are informed they work for the Umbrella Corporation as decoys living in the mansion to guard the underground facility. The computer system released a nerve gas which has caused their amnesia, and the base has been sealed but no one knows why. As it is revealed the T-Virus was attempted to be stolen and was released, infecting the entire facility, which the computer shut down and sterilized. This meant killing every living thing on the site. As the group descends into the Hive to locate the computer room, it is reactivated which opens all the locked doors allowing the mutant animals and zombie staff to run loose. As their group dwindles in number, they try to find the anti-virus and the T-virus. The video game elements of battle and mutated animals are well played out during the search for the anti-virus, which is missing. Their memories are gradually coming back and they realize the anti-virus is on the train, and that one of them was the person who stole and released the virus. The zombies and animals attack at every turn infecting others with the virus. Once an animal bites someone, it is revealed, that they mutate even further when they have ingested new DNA material. The infected in the group are too far gone with the virus for the anti-virus to have any effect, and they in turn become zombies and attack their companions. Alice, the heroine, has to kill and battle through until the end, when her friend is bitten. They are both hauled off in opposite directions, she to a hospital bed, he to what us ominously referred to as the Nemesis Project. We then cut to Alice awakening in a hospital bed, struggling to her feet. She escapes the hospital to see a deserted city. The newspaper on the ground reveals the horrible truth that the T-Virus escaped the Hive and ran through the city, leaving no survivors. Resident Evil is currently available to watch and stream, download, buy on demand at Amazon Prime, Starz, IFC, Amazon, Vudu, Google Play, iTunes, YouTube VOD online.